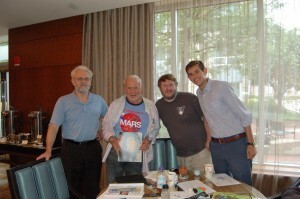 Today I had the opportunity to meet with Astronaut Buzz Aldrin as part of my role with The Mars Foundation. Buzz is truly a unique character during out time together he had to do a phone interview with a South Dakota radio station which was interesting to listen to. He discussed many of his ideas for Mars transportation including the Aldrin Mars Cycler plan, utilizing the moon Phobos before landing on Mars, how to utilize a Mars Lander even for Earth return, and many other ideas. We had the opportunity to talk about In-situ Resource Utilization and how that could be utilized to produce fuel, oxygen and materials that could be used in 3D Printing applications. He also shared with us a plan to develop a series of modules that would initially be used as a moon base but longer term would also be usable on Mars. During the four plus hours we spent with Buzz it was clear that he is very passionate about sending Humans beyond Low Earth Orbit and is very active in trying to involve as many nations as possible working together and including commercial entities where possible to build the various components that would be needed to achieve this vision. It was truly an honor to spend time with a man who has really gone where no-one had been before and even all these years later very few have been.